In continuing developments in Libya, protestors on Friday stormed the headquarters of Ansar al-Sharia and the Sahaty Brigade. 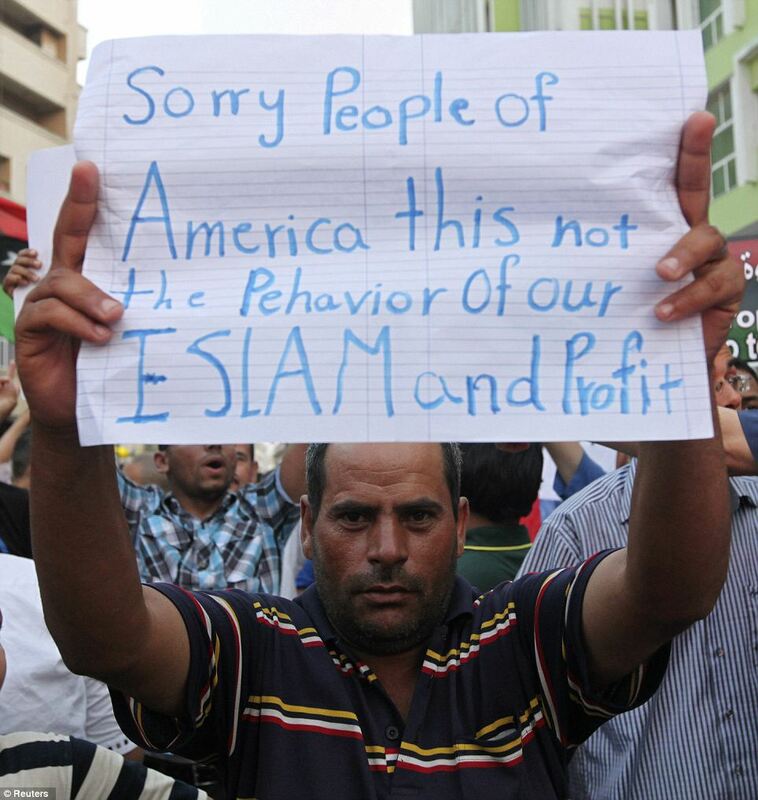 Both groups were believed to be involved in the recent attacks on the US Consulate in Benghazi. Anti-American protests continue to reverberate across the Middle East in response to a trailer for the controversial film The Innocence of Muslims. The trailer—which makes B-movies look like Academy Award material by comparison—was apparently shot to promote a film which (given the quality of the acting, thankfully) was never made. Nevertheless, many protestors believe the film was produced and that it mocks the Prophet Mohammed. While protests against the film continue in many parts of the Islamic World, in Libya, the protests now appear to have a different message. 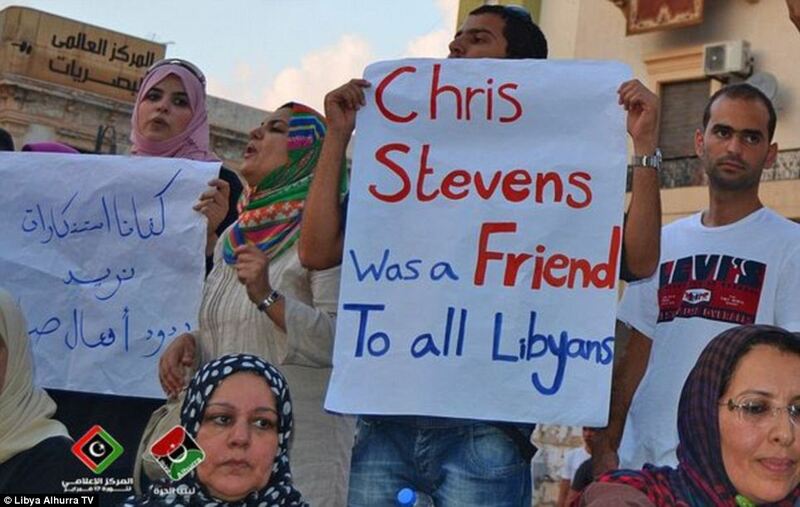 Protestors there have taken to the streets there to demand justice for the killing of US Ambassador Chris Stephens last week. Many have carried signs like those here. There appears to be reason to believe that Libya has, as the BBC put it, “bucked the Islamist trend.” While democratization has been a boon to the Muslim Brotherhood and other fundamentalist Islamist political parties in Tunisia and Egypt, in Libya there appears to be much less support for fundamentalist parties. There is a rich tradition in political science of exploring why some countries move towards liberal democracy while others do not. Common theories center on one or more of the following variables: wealth (gdp per capita), education (especially female education), a free market economy, social equality, a civic culture, cultural values, foreign intervention, and even age distribution. Unfortunately it is not clear yet why (or even if) Libya is moving towards liberal democracy while its neighbors are not. At a minimum, though, the contrasting experiences of Libya, Tunisia, and Egypt will likely provide interesting case studies for comparativists moving forward. What do you think: What drives democratization? Will Libya sustain its move towards democracy? Or will the trend reverse? This entry was posted in Uncategorized and tagged Arab Spring, democratization, Egypt, Libya, Tunisia. Bookmark the permalink.